This 1997 creation by North-American architect Frank O. Gehry is still a blast for the senses, two decades on! We love it for its distinctive titanium curves and soaring glass atrium. Everybody who goes, adores the Jeff Koons Puppy and Richard Sierra’s ‘The Matter of Time’ and many of the other permanent exhibits. 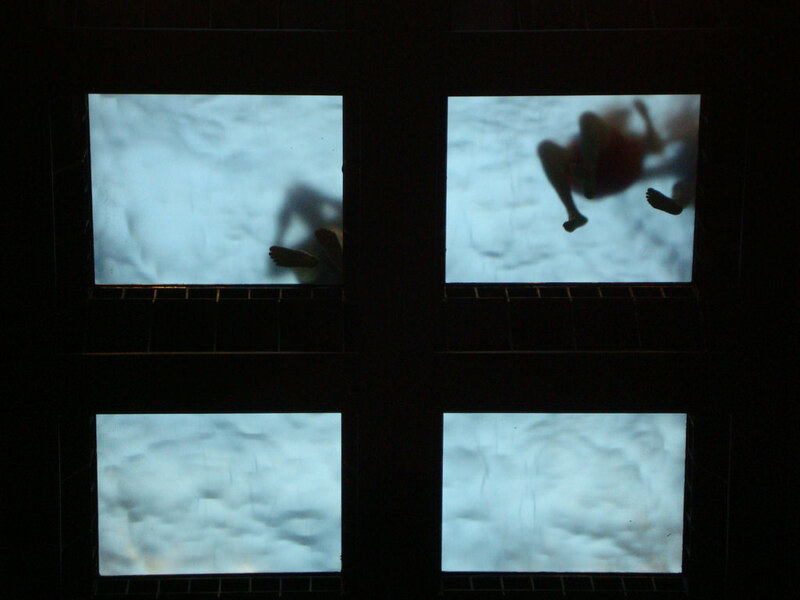 But it’s also the impressive temporary exhibitions that draw millions of visitors to the city every year. We have some favourite corners to hang out – by the Puppy – of course and under the spider, beside the tulips and we like to climb up the red La Salve bridge to take in the views from there too! See here for the permanent collection, current exhibitions and opening times and admission rates. If you are hungry and feel like a foodie experience inside the Guggenheim space, head to Nerua restaurant which has one Michelin star and is ranked #55 in the world – not bad for a museum eatery! Remember to PRE-BOOK your ticket to avoid queues. With so much to see in the city, it’s a shame to waste any time standing in a line! We love the modern riverside walk that goes from the Guggenheim to the old quarter of Bilbao. 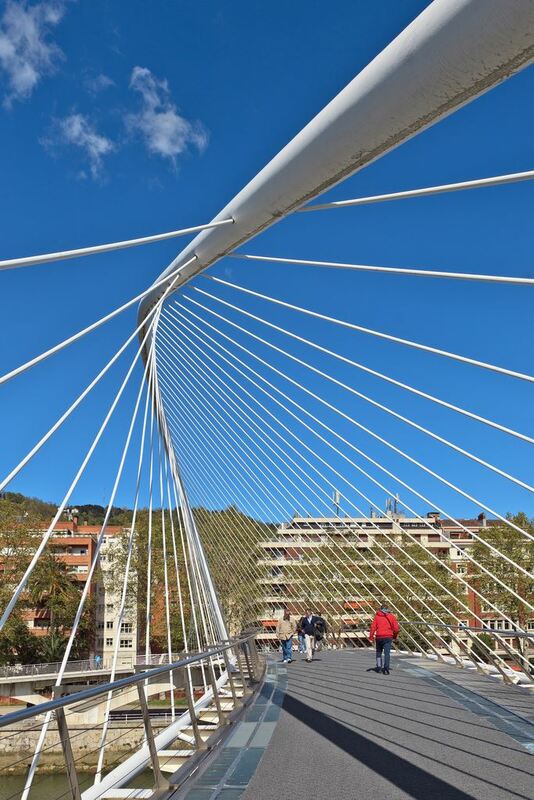 You get to see the stunning Calatrava bridge called Zubizuri meaning ‘white bridge’ in Basque. This tied arch footbridge that crosses the Nervion River was opened in 1997 – the same year as the Guggenheim. Handsome by day, this bridge becomes ethereal by night. If you are a big fan of bridges – you’ll want to see this one before and after dark. Although many visitors are attracted to the Guggenheim, it’s the old part of the city known as the old Casco Viejo that is often the highlight for many of Totally Spain’s clients. The Washington Post calls it “a pedestrian’s paradise woven with medieval streets, cafes and tapas bars”. Inside this old quarter, you’ll find the Siete Calles (meaning Seven Streets) which showcase just how fun and challenging urban life in Spain is. You’ll find hundreds of bars and restaurants here and for dessert, we love the many old pastry shops that have been in business since the 1830s. Go in and have your choice boxed and wrapped up beautifully. If you want to do some people-watching, you really can’t beat the Plaza Nueva (meaning New Square) which was built in 1821 and is so-called to differentiate itself from the Old Square near the Ribera market. 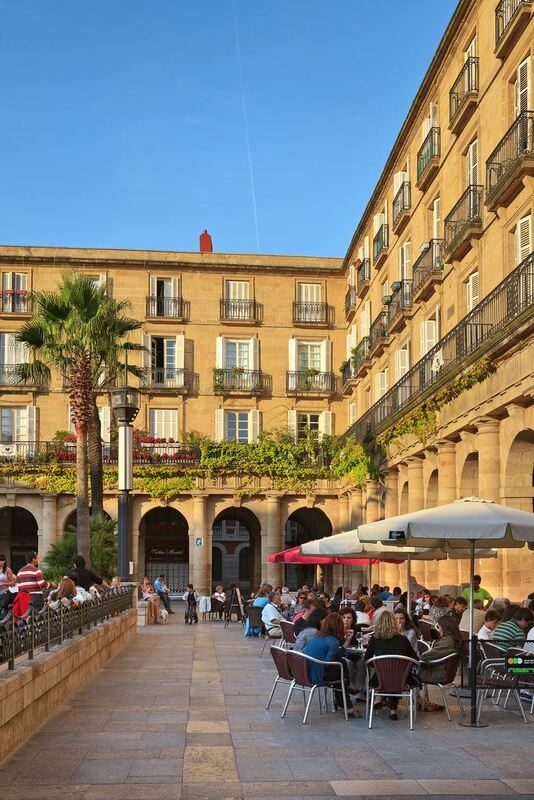 It’s a wonderfully elegant plaza and great for snacks and pintxos as most of the businesses under the arches are bars and restaurants that (of course) serve eye-popping creations. Before you get overly hungry, we strongly advise you experience the newly refurbished Mercado de la Ribera on the edge of the Old Quarter where old meets new. We love its fin-de-siècle design, its produce and you won’t find better and fresher anywhere in the city. We love this idea by a restaurant inside the market, that allows you to buy your own ingredients from the market stalls and they’ll prep it for you. It’s a great way to try new ingredients but you do need to pre-book this service. As you’d expect, Basque cuisine is 100% delicious and very much based on quality ingredients – whether you’re eating in a pintxos bar or enjoying high dining in the city’s top restaurants. Don’t ask us to choose between Bilbao’s century old institutions such as Café Iruna and the ever popular pintxos bars on Plaza Nueva (pictured above). We’ve also enjoyed the renovated restaurant in what was an old salt warehouse that goes by the name of Bascook. 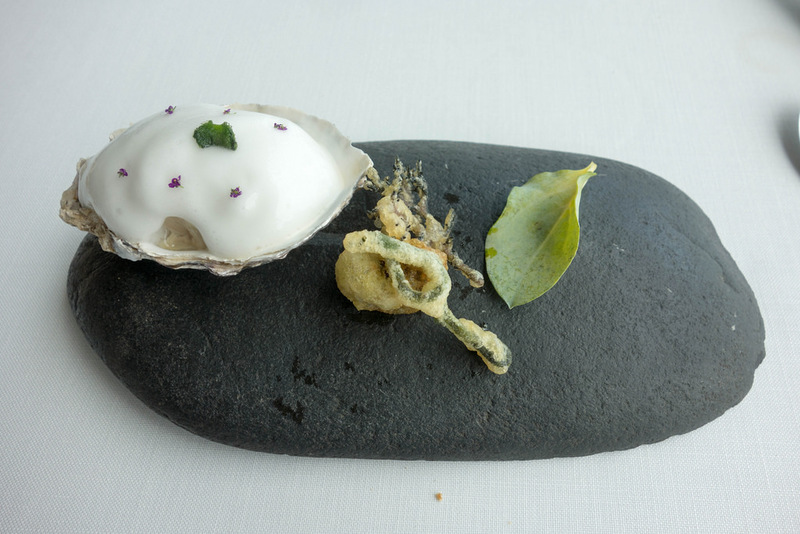 If it’s fine-dining you want, we’ve already mentioned Nerua in the Guggenheim and you should also consider eating at the three Michelin-starred Azurmendi which is in the hillsides of the city – about a 10-min cab ride from the Guggenheim. Back in the city and Restaurante Zortziko (1 Michelin star) and the old tavern style, El Viejo Zortzi are very good. And a very worthwhile 35-min drive out of the city takes you to Asador Etxebarri which was voted 10th Best Restaurant in the World in 2015. We also highly recommend the Metropol Bistrot across the road from the Guggenheim at the Gran Hotel Domine. Terrific food, service and value for money. Wherever you eat, make sure to try a few of the traditional dishes such as fish cooked ‘al pil pil’ and anything you see prepared ‘a la vasca’ or ‘a la bilbaina’ which will be locally styled. And marmitako is a great Basque fish stew using Northern tuna which you must try in the summer months. Peppers are very important to the colour and flavour of the dishes in Basque cuisine so make sure you’ve ordered something with peppers or pick up a little jar of the pepper paste to take home. When it comes to wines, the locally produced white Txakoli is very popular and for red it must be Rioja Alavesa wine (which is the part of Rioja that is inside the Basque Country). If you like to do wine-tastings, you’ll love the urban winery very aptly named Bodega Urbana in downtown Bilbao run by enologist Ana Martin. Offering wines for every budget, it’s perfect for an evening of great food and wine. If you really want to go ‘local’, the gastronomic societies which are private clubs make great locations for any cooking and socialising in the Basque Country. You probably know that there is a Basque language called Euskera – you’ll hear it spoken in Bilbao although almost everybody speaks Spanish also. You may also know about the Basques being a sea-faring nation and you’ll see this is still evident today in the strong rowing traditions and in the many fish dishes on the menus. 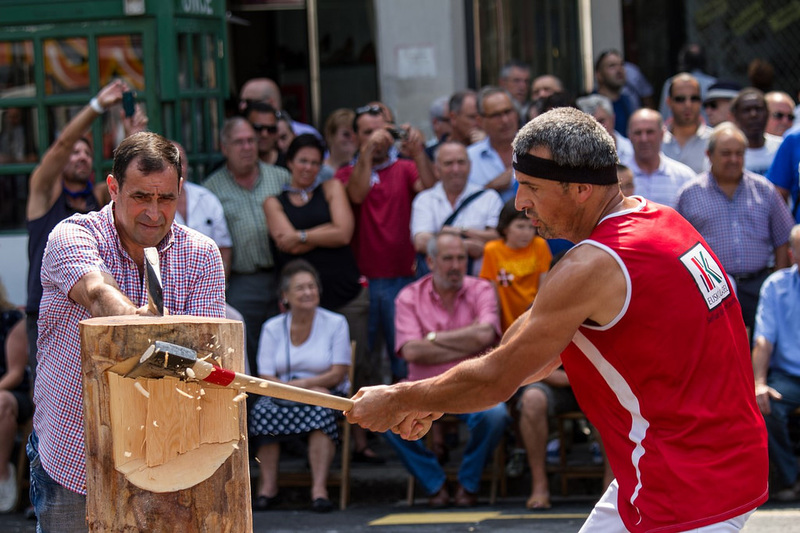 Keep an eye out for Basque rural sports such as stone carrying and wood chopping and the tug-of-war which always attract a crowd. You’ll also find Basque pelota and you may even come across ochotes – choirs of eight men. Wherever you go, you’ll see men wearing the traditional ‘boina’ or beret. And you’ll also come across the lettering in the Basque font – especially on restaurant and bar signs. When we see it, it usually means that the food is going to be good – although it’s very hard to dine badly in Bilbao! We love taking the modern tram along the Ria especially when there are small children or tired adults in tow. Hop on at the Guggenheim and you’ll pass by the Zubizuri bridge and jump off at the Teatro Arriaga – the stunning theatre that dates from 1890. BTW Make sure to check out how the tram lines have grass growing underneath near the Guggenheim. Very green! If you like good views, you have to take the funicular ride up to Artxanda that affords terrific views of the city. This cable railway has been shuttling passengers since 1915 and it takes 3 minutes to climb 770 metres. If you’re coming from the Guggenheim, it’s about a 10-min walk to the lower station. When you get to the top at Artxanda, you’ll find lots of places to eat and have a stroll around. The funicular runs every 15 minutes – and closes at 10pm (11pm from June – September). Whether you use the metro or not, make sure to check out the Fosteritos which are the entrances – the handiwork of Norman Foster. And keep an eye out for the ironwork and beautiful stained glass at La Concordia train station – it’s just across the river from the Teatro Arriaga. Finally – if you have a good head for heights or like feats of engineering, you have to head for Portugalete to the Hanging Bridge built in 1893 and still in use today. 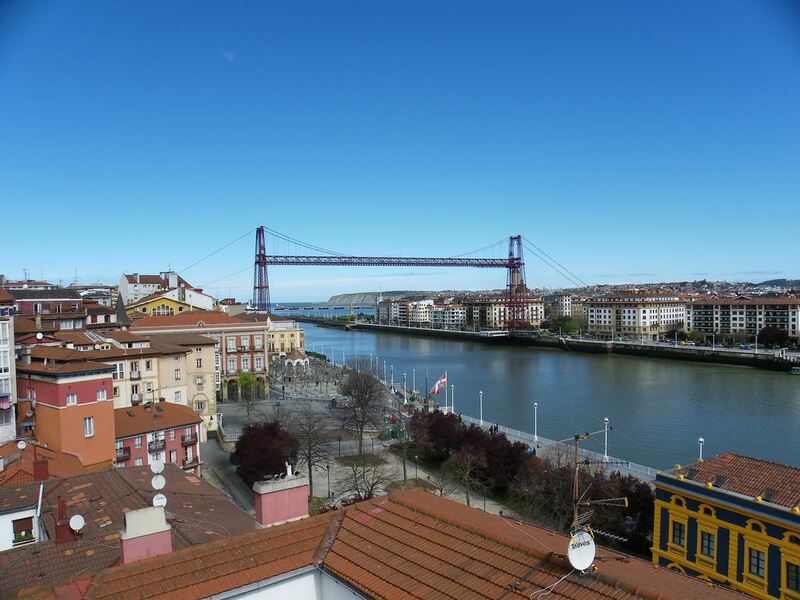 You can walk, cycle or drive onto what is the oldest hanging transporter bridge in the world and travel over the River Nervion from Portugalete to Las Arenas or vice-versa. Designed by Alberto Palacio, this UNESCO World Heritage site it’s standing strong at 160m long and 61m high. If it’s warm, we recommend hopping on a metro to the nearby beaches. If you want more than just a dip, we often recommend the small fishing town of Getxo. Part of Greater Bilbao, it has a charming old quarter, an old port and is walking distance to some of the lovely beaches. If you happen to be here in July, you’re in for a treat. The Getxo International Jazz Festival is well-worth attending. If you fancy a dip but it’s not quite beach weather, check out the Philippe Starck re-designed Alhondiga cultural centre that used to be a wine warehouse in downtown Bilbao. It was originally designed by Ricardo Bastida in 1909 and was re-furbished by Starck back in 2010. We love the swimming pool there – as you can see below, it’s not every day you get to swim through such beautifully executed architecture. The wine-regions of the Rioja and Rioja Alavesa regions are literally sneezing distance away. And some of the wineries have called on the biggest names in architecture to design their spaces which makes for an exceptional winery visit. We always recommend the Frank Gehry designed Marques de Riscal winery, Calatrava’s Ysios winery, Zaha Hadid at Vina Tondonia and Inaki Azpiazu at Baigorri. In addition to tours and tastings, some of these wineries have really impressive restaurants and hotels! Of course, you have to balance the big guys with the smaller producers and there are lots of the traditional wineries that are well worth visiting too. 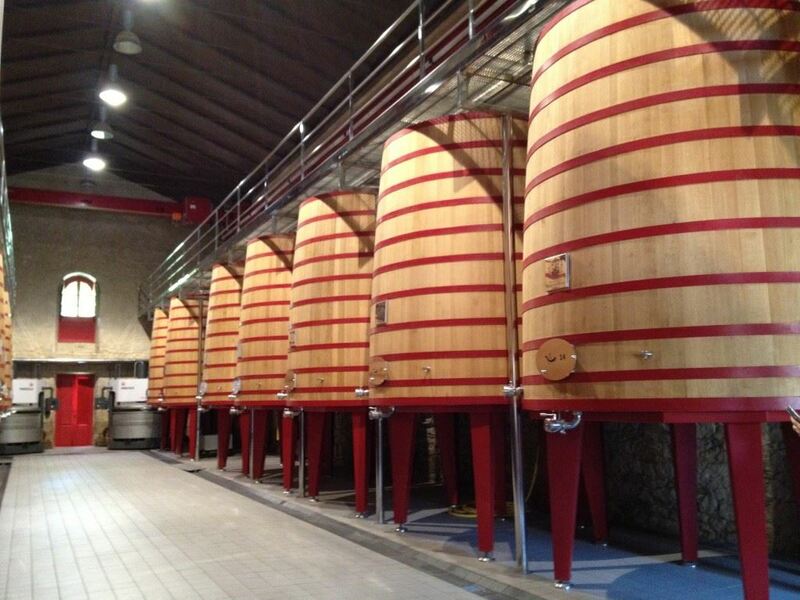 For more information on wineries near Bilbao, check out our detailed post on Laguardia and the Nearby Wineries! And Totally Spain’s award-winning guide to La Rioja. We’ve also written about Vitoria and its picturesque villages that make a great driving tour also. Remember September is harvest month when you’ll find some excellent festivals celebrate the new season’s grapes! We can arrange winery tour bookings and suggest festivals and nearby attractions to visit as well as arranging a private guide and/or driver to take you there and back. The Basque coastline is stunning – we love Mundaka for its wild waves and surfy atmosphere. For something more spiritual and still, try Gaztelugatxe near Bermeo – which is one of those almost mythical spaces – complete with hermitage and a most interesting access walkway. And of course, you also have San Sebastian where you can visit the Chillida Windcomb sculpture on the beach and take a walk up to the Monte Igueldo to see why so many people fall for this city. San Sebastian or Donastia, as it is called locally, is home to more than its fair share of Michelin stars: Mugaritz, Arzak, Akelarre and Martin Berasategui. The city is also well known for its brilliant tapas bars which are groaning with some of the nicest and most handsomely presented pintxos you’ll ever see. And the Concha beach, as you can see below, is pretty spectacular too! We’ve written about the city which was European City of Culture in 2016 here. Be careful though, it’s a very romantic place. At Totally Spain we’ve known several couples who got engaged in San Sebastian and we’ve even organised several weddings here. 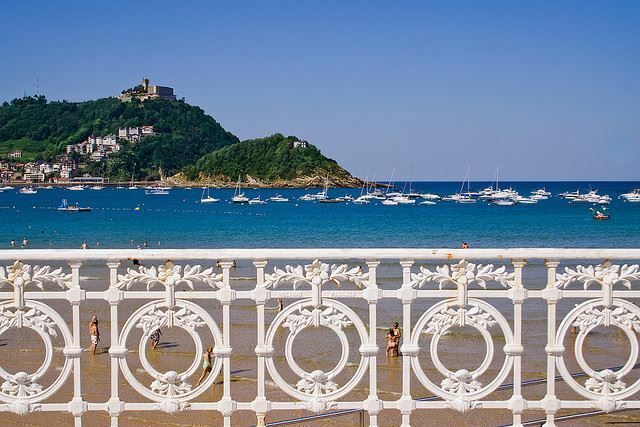 That is why San Sebastian features in our Top Places to Propose in Spain. If you’ve hired a car and want a driving theme with a difference, why not go west into Cantabria and see the UNESCO-listed medieval town of Santillana and visit Gaudi’s Capricho at Comillas. You can visit the UNESCO listed caves at Altamira and walk, cycle or drive the Camino Lebaniego by the Picos de Europa. 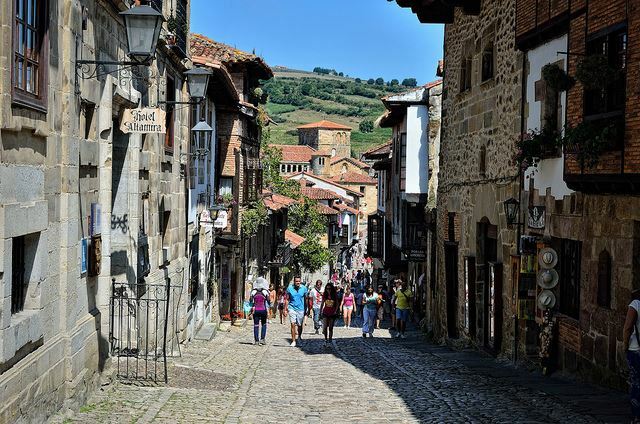 You can read all we’ve written about wonderful Cantabria here. 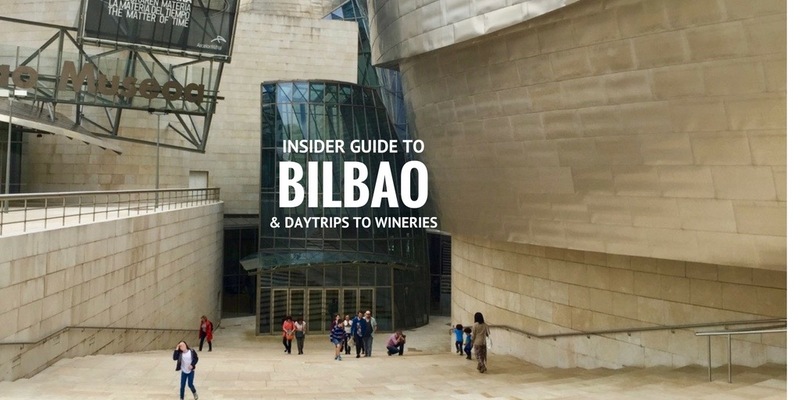 Bilbao is a great all-year-round destination. It’s buzzing in the Summer especially when the Semana Grande celebrations are taking place (last week of August) but we equally like it during the Winter when it’s quieter and you get to enjoy all the hearty Basque stews and casseroles. Sales are on too just after Christmas! Autumn is great because there is a real sense of harvest time – both on your plate and also in the countryside. And Spring is always a great season to visit any part of Spain, when the tourist season hasn’t quite started. Top of our list is always the Silken Gran Hotel Domine in Bilbao which is a five-star modern hotel, literally in front of the Guggenheim. Great for dining, the views from the terrace bar / breakfast area on the 7th floor are wonderful. Make sure to take the elevator on the left which goes all the way to the top! The designer of the hotel is Spanish artist Javier Mariscal who came to international attention for his work on the 1992 Olympics in Barcelona. The Valencian’s touch is visible throughout the hotel – with every detail right down to the uniforms designed by him. Of course, we work with all the major hotels in Bilbao and its surroundings. We’re big fans of the four-star Hesperia across the Zubizuri bridge and for old world charm, it has to the five-star Carlton. We’ve been planning itineraries to the Guggenheim and around the Basque Country since we first set up in the Basque Country back in the year 2000 so whatever requirements you have, we’re here on the ground and have the contacts and the experience. Posted in Accommodation, Basque Country, Bilbao, Food & Drink, Green Spain, San Sebastian and tagged accommodation, Alhondiga, Basque sports, Calatrava, Cantabria, Casco Viejo, Fosteritos, Frank Gehry, funicular, Getxo, Guggenheim, Hanging Bridge, Jeff Koons, metro, Michelin-stars, Puppy, Rioja Alavesa, San Sebastian, Siete Calles, tram, Zubizuri.